Mellow Bakers: Miche, Pointe-à-Callière ~ I Can Do That! Woohoo, I finished baking all 3 May 2010 MellowBakers breads with Miche, Pointe-à-Callière. I made a very small baby-size, 1 pound 10 ounces boule knowing I'm the only one who's going to eat it. Sour breads are not very popular around here. Besides, I didn't want to get disappointed if the bread turned out inedible. It was a pleasant surprise when I cut open the bread to find it has a moist chewy open crumb as Jeffrey Hamelman promised. And it is also not too sour, at least to me it isn't, and has a smokey flavor that I really like. I hope the flavor gets even better just like Peter Reinhart's Miche recipe. I give Hamelman's recipe one point higher than PR's because of the beautiful open crumb. 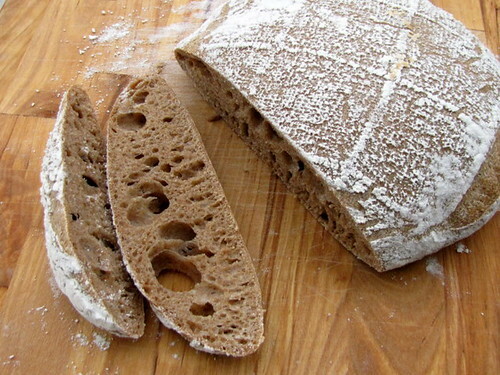 Miche is a sourdough starter-raised bread that takes 2 days to make. A sourdough build is prepared 12 hours before and mixing, fermenting, shaping, second rising, and baking takes approximately 6 hours. 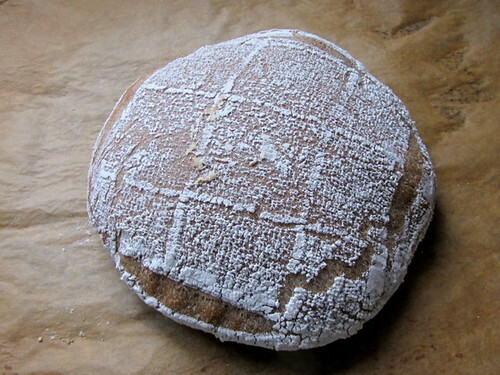 This bread needs a baker's full attention as it has to be folded 3 times during fermentation. I was not expecting too much from this bread as it was slooow in growth and super wet. I kept peeking while it was rising and didn't notice it getting any bigger and after 2 hours I poked it and it was ready. I was still suspicious and thought it wouldn't hold its shape when I inverted the basket on the peel [with a piece of parchment paper], but it did. And it had an oven rise of 1 inch and less than an inch all around. I'm very happy with the recipe, it's worth making again. Thank you Messrs. Hamelman and MacGuire. love to bake? then click on the logo and join us. That looks great. I finally got my book so I plan to try it this weekend. That looks delicious. I am thinking of skipping this one. I was on a miche roll :) and am tired out. Anne Marie, I was also going to give it a pass but I wanted to compare with Peter's.